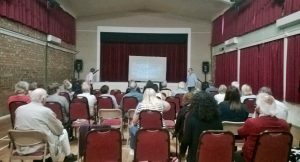 Over sixty people came to Staintondale village hall on 7th September to learn more and discuss their concerns about fracking. Organised by the recently formed Frack Free Scalby, Burniston & Cloughton, it was one of a series of events organised to raise awareness about the potential consequences of unconventional extraction of gas from shale through ‘hydraulic fracturing’. Local concern has been prompted by the recent decision by North Yorkshire County Council to grant planning permission for fracking operations by Third Energy at Kirby Misperton (a decision currently subject to judicial review), and by the granting of a licence to a consortium including Third Energy and Europa Oil Gas Limited to explore for oil and gas over a 110 square kilometre block to the north of Scarborough. Europa’s CEO Hugh Mackay is on record as saying that they will be exploring prospects for unconventional (fracking) as well as conventional oil and gas. The meeting saw a film produced by Steve and Joanne White from Ryedale who went to Pennsylvania in the USA to hear from local residents what it is like to live in an area where fracking has been a feature for several years. Their experience convinced them that fracking is against the interests of local people. The film showed how communities have suffered from toxic chemicals in the air, pollution of families’ groundwater sources, massive trucks carrying sand, water and chemicals to fracking sites – and toxic waste water in the other direction. In the discussion that followed, concerns focused on the potential impact on traffic in the area, threats to our health through water from polluted boreholes used in homes and on farms, air quality, and climate change through the escape of methane from the fracking process – and the fact that there is no clear plan for how the millions of gallons of toxic waste water would be disposed of. A key question was how local people can influence, even stop, fracking in the area. Steve’s response was to encourage us not to sit tight and let it happen, but to find out more about the process and the dangers, and bring these findings to the attention of decision makers and elected representatives at all levels from Parish Councils to MPs. In particular it is important to be able to counter the industry’s bland statements about safety and benefits of fracking through informed and reasoned argument. This entry was posted in Uncategorised on 16th September 2016 by admin. 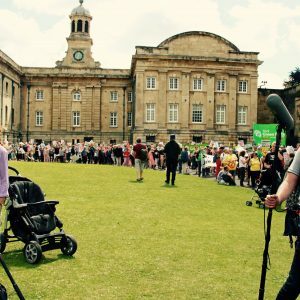 Up to 3,000 people – including many from Scarborough – marched through the centre of York on Saturday to highlight opposition to fracking, here and everywhere. According to some reports, it was the biggest protest against fracking ever seen in Britain, and was supported by groups from Yorkshire, Lancashire and beyond. Organised by Frack Free York, the demonstration started at Clifford’s Tower in a colourful array of banners and placards, and the mood was defiant and upbeat. The Lancashire Nanas, in their distinctive yellow tabards, were in fine voice as always, and were joined by a large contingent of their Yorkshire counterparts in light blue – including at least two ‘Mananas’! With chants of ‘No fracking Yorkshire – no fracking anywhere!’ and ‘Once you frack you can’t go back – ban fracking now!’, the march snaked around the city centre, leaving on-lookers (many of them supportive) in no doubt as to our cause. Thanks to the majority decision of a small clique of mainly Tory councillors willing to do the Government’s bidding, Kirby Misperton in Ryedale has been chosen to kick-start the dash for ‘unconventional’ gas, but there were no ‘Nimbys’ among us as anti-frackers see a threat to one community as a threat to all. 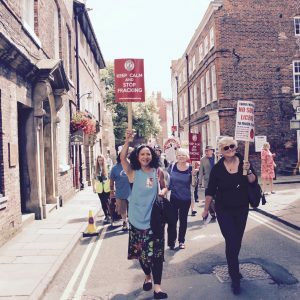 The march ended in a large rally outside York Minster, where activists spoke eloquently of the threat posed by fracking – or whatever the industry and its backers might choose to call it. 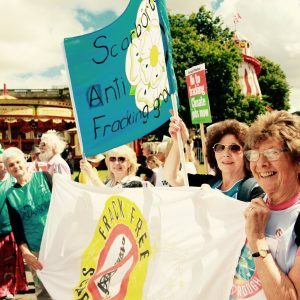 Kim Hunter, of Frack Free Scarborough, said our movement should draw strength from the different campaigns mobilising around the country challenging the status quo and business-as-usual politics. Just the day before the march, Jeremy Corbyn had filled St Helen’s Square in York. Some of the biggest cheers of the day were for reluctant heroine Tina Rothery, who put her name to a protest in a field near Blackpool ear-marked for fracking. There was also a good response to the public debut of Frack Free Scarborough’s own anti-fracking song, written by and accompanied by our own Dave Mason. This entry was posted in Events on 6th August 2016 by admin. Last night Burniston & Cloughton residents met local North Yorkshire couple and producers of ‘Living with Fracking’, Joanne and Steve White, to learn about the potential impact of unconventional fracking in the villages. Ryedale couple Steve and Joanne White went to the heavily-fracked US state of Pennsylvania to find out what it is like living in a gas field. Their trip, captured on camera, convinced them that fracking should be banned. Joanne and Steve’s film ‘Living with Fracking’ sparked an interesting discussion. Joanne and Steve explained the differences between ‘conventional’ and ‘unconventional’ fracking, and concerns were raised with the likely risks posed by ‘unconventional’ fracking on services, homes and health in Scarborough. Fracking in this way does not appear economically viable, as the industry estimates that it will be 10 to 15 years before unconventionally fracked gas could contribute to energy supplies in the United Kingdom. By this time, there will be a greatly increased need to reduce greenhouse gas emissions, including methane, which is emitted in great qualities through the new fracking process. Support for renewables among residents was strong. By the end of the evening, the majority united against the imminent threat of ‘unconventional’ fracking in Scarborough, and elsewhere in the UK. A follow up fracking meeting will take place at 7:15pm at Burniston & Cloughton Village Hall on Wednesday 3rd August. All local residents and interested parties are welcome to attend. Please watch this space for further public information sessions in the coming weeks! This entry was posted in Events on 28th July 2016 by admin. All welcome to attend Yorkshire’s march and rally to ‘Say No To Fracking’. When: Saturday 30th July 2016, 12:00pm to approx. 2:00pm. Where: Meet 12noon at Clifford’s Tower, York. Marching to: York Minster for a rally with campaigners, experts and political representatives starting around 1pm (speakers TBC). 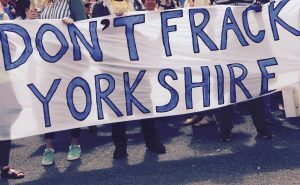 Details: A demonstration of solidarity for all of Yorkshire’s anti-frackers to show how strongly we feel about not letting any unconventional gas extraction in our area, marching on the streets of York against Fracking. Organised by Frack Free York. No.3 Park & Ride service stops on Tower Street, 200m from the assembly point – catch it from Askham Bar Park & Ride site (off the A64) or York Rail Station. Nearest Coastliner bus stop: Stonebow. Nearest Arriva/East Yorkshire stop: Piccadilly. Please r.s.v.p. and share the Facebook event with your friends and family. 1.6k people are invited so far! This entry was posted in Events on 10th July 2016 by admin. Please add your name to the growing number of people, committed to saying no to fracking in Yorkshire and no to fracking anywhere. “We, as people united across Yorkshire and across Britain, declare that we remain opposed to fracking in Yorkshire, in Britain, and across the world. We know that fracking carries serious risks to local people, to our health, our water, our wildlife, and contributes to climate change. We are extremely disappointed that North Yorkshire County Council has not listened to the overwhelming wishes of the locally elected representatives of Ryedale and local people and has approved Third Energy’s application to frack in our county. This decision is not in our name. We know that Third Energy and their backers Barclays bank are the only ones that stand to benefit from these fracking plans. This application would put at risk Yorkshire’s beautiful landscape and the tourism industry that inspires millions of visitors each year and supports thousands of jobs. We have a positive democratic vision for Yorkshire and the UK with thriving rural economies, clean air and water, producing the green energy like solar power we need to protect our children’s future, and creating the thousands of green jobs along with it. We urge and will support the Government to develop a balanced long term energy policy that will achieve our globally agreed climate change targets. Today we resolve to continue to fight to remain free from fracking, to protect our communities, our beautiful countryside, our air and water, and to protect the future of the planet. We ask people across the country to join us by supporting this declaration. North Yorkshire County Council have said Yes to dangerous fracking. This is despite the opposition of thousands of local residents, businesses and Ryedale District Council. Fracking poses unacceptable risks to people’s health, homes and goes against everything we need to do to tackle dangerous climate change. The people of Yorkshire want to make it clear that this decision is not in their name, and they will continue the fight against fracking. Will you stand with them? Together, our people power has kept the UK free from fracking for 5 years now. Let’s stand with Yorkshire and make sure Britain stays frack free. Limited by Guarantee Registered Company No. 6642193 in England and Wales. Registered office: 40 Bowling Green Lane, London, EC1R 0NE.